After app. 3,5 hrs in the car from our home we have boarded the car ferry Stena Danica on tour from Gothenborg to Fredrikshavn in Denmark. Sailing out the ferry pass this fine old Fortress - protecting Gothenburg. 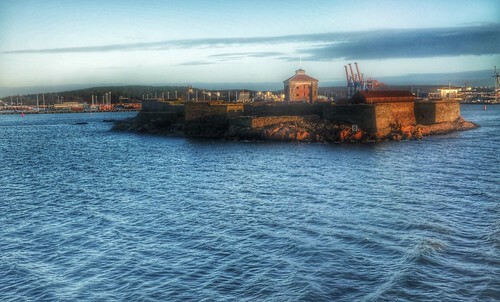 Nya Älvsborg Fortress is in the middle of the sea approach to Gothenbug. 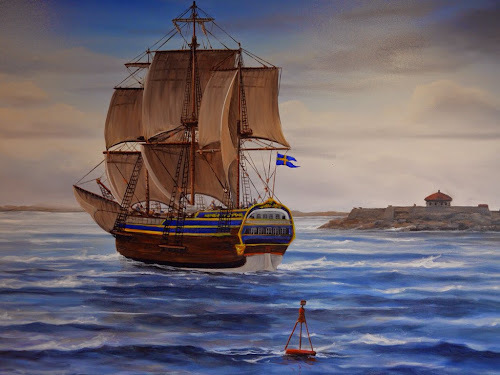 In 1644 a Danish naval force blocked the sea approach by occupying the small island of Kyrkogårdsholmen. After the Swedes, with the assistance of the Dutch, succeeded in driving the Danes off, it was decided to build a new fortress. At the same time the old Älvsborgs Fortress, which had fallen into disrepair, would be torn down. Construction of the new fortress began in 1653 according to fortification plans drawn up by quartermaster general Johan Wärnschiöld. Construction was completed in 1677. In 1719 Nya Älvsborg fortress was attacked and bombarded by the Danish navy for several days, during which it suffered great damage. This was, however, repaired over the following years. The eighteenth century saw several reconstructions and extensions. In 1766 the upper part of the tower was dismantled, and the tower was given its current appearance. From the end of the eighteenth century until 1866 the fortress acted as a prison. At most there were just over 100 prisoners. In 1868 Nya Älvsborg Fortress ceased to count as a defence facility. During the First World War the fortress was used for storage and accommodation in connection with mobilisation.